Make crafting and learning a regular part of your schedule with these events that I will strive to hold each month in the store. I invite you to come out and come often for fun, creativity, laughter, new friends and dedicated "me" time. 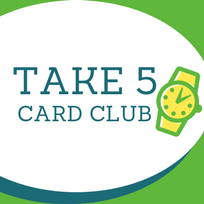 The Take 5 Card Club is designed to help you schedule time for YOU to "Take 5" minutes (well, actually 2 hours) for yourself on a regular basis and come out to craft with like-minded people. With each session, you will make and "Take 5" cards home. The cards are designed to build your stash but also to learn some new techniques. The first 2 cards (and you will make 2 of each, for a total of 4) will be clean and simple, which means that they are straight-forward to make, but will also include some techniques like stamping, using sketches and learning some basic design principles. The Fifth card will be a bit more FAB and bring in some more techniques and ideas too. The Take 5 Card Club is for crafters of all levels. New to stamping and cardmaking? Come out and learn what it's all about. Experienced and avid cardmaker? Come out for some social time, some (hopefully) new ideas and to make time for your love of crafting. 5 Cards -- 2 each of 2 classic designs, plus 1 "FAB" #5 card, featuring extra techniques. First Tuesday evening and Thursday afternoon of every month (some exceptions). Visit our Classes page for details and exact dates. What's the key to colouring with Copic (or any other brand of alcohol) markers? 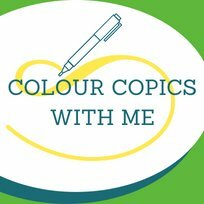 In these sessions, I will provide you with up to 5 stamped images that we will then colour together. While colouring, I'll share tips, tricks and my approach to colouring. Ideally, if you have any Copic markers (or other brands too), please bring them. I will also have one class set of markers that can be shared. Each month will feature a different theme for stamps and techniques. Various dates and times each month, 2 hours each.